This painting was done in acrylics on stretched canvas. The canvas was 28” x 20” in size, bigger than the normal size I work to because of the intention of it being exhibited in a large gallery. The scene shows the main road running through Northam, Southampton which had been closed off to some traffic as to be used for part of the course for the ABP 2016 Marathon, held on April 24. 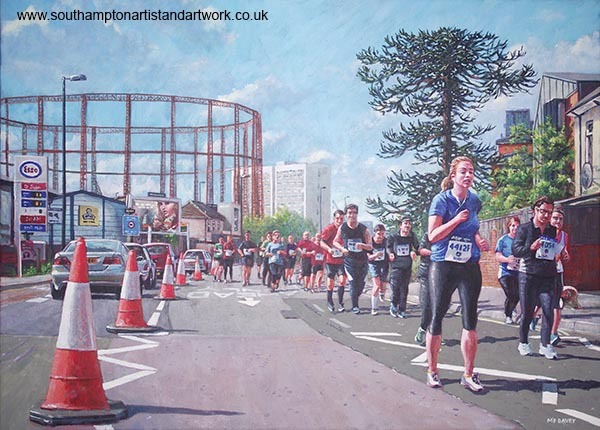 The painting is based on a number of photographs taken on the day and a new composition was done using Photoshop, mainly to juggle the runners to a more pleasing grouping. The girl was used as a focal point within the composition. From this composition the scene was scaled up and redrawn on to the canvas. Some of the elements were quite difficult to do, in particular the listed gas holder in the background, now out of use. The painting was completed during June 2016. This painting was one of two, produced for the City Art Gallery’s Open Exhibition 'A Sporting life', during Summer 2016.